High Riser: Funny? Not funny! NO arguments from me. I am appalled that the Adani mine is still being considered. On a positive note THIS decision in NSW is encouraging. EC, I did pick up on that NSW story. From what I hear Adani is already polluting our country, with a release of coal dust water in a waterway. It is a disgrace. Water from the North Queensland floods is heading towards Lake Eyre. The words written by a 19 year old Dorothea Mackellar in her poem "My Country" - written in 1914; published 1918 - are as true today as they were when she wrote them. Lee, Lake Eyre used to only fill rarely. Now it is filling often. Yes, it is not over yet. Wow, that sounds bad all around, Andrew. The Queensland floods made the news here. I thought of you, down under. I trapped cats in Brownsville last fall. Old woman. But her adult son, in his late 50's, flies fire fighting helicopters and he was off to Australia at that time, although then just as I was trapping, his father, the old woman's husband, died unexpectedly of pneumonia, so I'm not sure he took that job or if he stayed. He said he loves it and flies the huge ones. He said it is a constant adrenaline rush. So we have too here experienced the vast array of extreme fires, winter storms (not in Oregon though), hurricanes, all of it, and yet the deniers continue and probably humans will destroy our own place to live, like any over reaching species will do, even despite our big brains. I still think the only answer would be what I do with out of control cat colonies, whose damage is very very mild by comparison to human colony damage. And you know what that is: humane population control through spay neuter. There are too many of us doing too many nasty things to the earth. Strayer, all interesting. Fire fighters are exchanged often between Canada, the US and Australia. No border wars between us, unless #43 makes one. Can I help you with choosing the men to be snipped? Oh of course. We'll get together and make a list. With you on Adani totally. Hels, you just know it serious when you see old people marching against Adani in protest at Camberwell Junction. Of me John? So you should be. 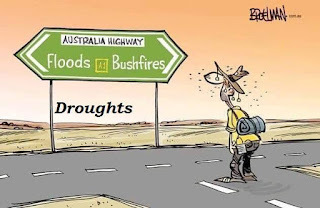 I wasn't aware until recently of the connection between the agricultural irrigation and the droughts there. 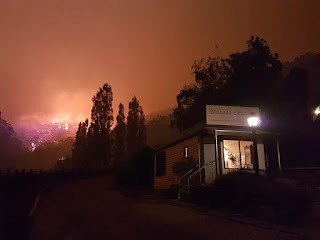 It seems so logical when a person looks at the big picture, that the crops are wrong for the area and there doesn't need to be the loss of water for people and wildlife and the ensuring fires. But somehow people at the top can't seem to see these things. The "people at the top" are the blindest and most deaf of all. Jenny, good that you picked up the obvious to most people. People at the top do know, but choose to ignore. River, they are not. They are smart and intelligent people. Their focus is on power, money and control, whatever way they can get it. Andrew; I meant blind and deaf to the needs of the minions, the needs of the lower lakes, the rivers and the farmers at our end who have to manage on the trickle that's left. They do know, and not until voters vote against them will they listen. The first sign - a sarcastic one to me, 'the lowest form of wit', so not impressed with the words. Was looking at photo of the floods and photos of no floods in Townsville. Dreadful, drought and fires...but that is the nature of Australia all at once. Margaret, but is the statement on the headstone not true? I think it might be. It has been a disastrous summer for Australia. 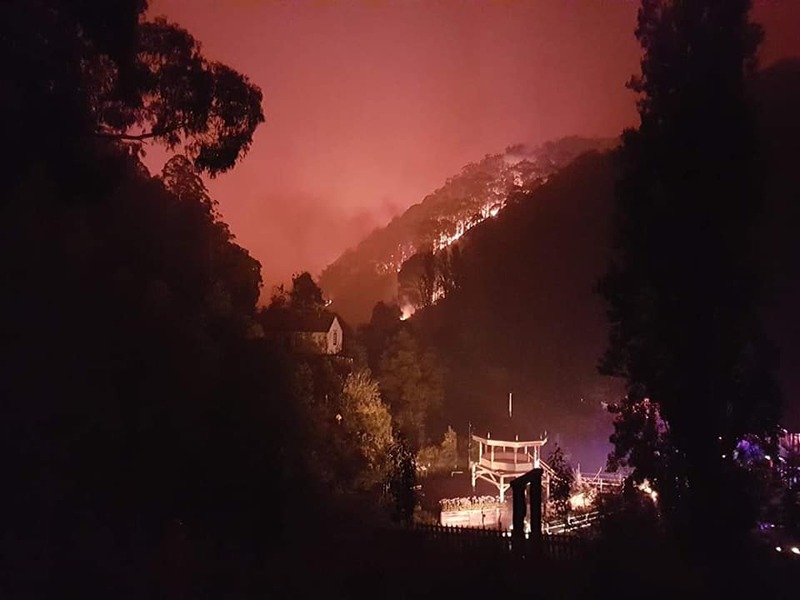 When have we ever had such climatic disasters in Australia? 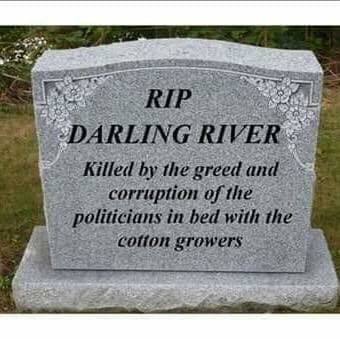 Of course the sign would be true - sucking up to the pollies so they can have the water and I expect for the rice too...still sarcastic though. Well we have had cyclones in the north, bushfires in the south all at once over the years with floods, not sure about so many dead fish though all at the same time.. I think the fish deaths are down to purely bad water management. Just read a book about the Snowy Hydro Scheme. They have been wanting governments to come to an agreement about water control for years. One that suits the environment and the farmers. There is no room for rice or cotton farms. We are exporting our precious water. Diane, indeed no room for rice or cotton. I reckon the book must be quite interesting. I was up in Cairns two years ago and it was so dry! Lady J, and it now is? I still maintain it would be well worth the cost (yes $$millions) to build concrete stormwaterways and catchment dams all over QLD and have the annual floodwaters piped down to the drier states. I've said this before: QLd's annual floods produce enough water to supply our entire continent. River, I have come around a bit to your thinking. Price of water pipe lines compared to desal plants. I don't know. Sydney's desal plant is being cranked up from zero and it runs on renewable energy. Meanwhile the rest of the world is trying to figure-out how we can stop the burning of Coal for good. My daughter, who lived in N Queensland (now in Brisbane) seemed to live in permanent fear of flooding, or extreme weather situations. Her home was built on slightly higher ground than most, and in times of flood her garden would full of Kangaroos and snakes, etc. One thinks of Noah's Ark. Cro, Queensland really is a place of extreme weather. Kangas and snakes in her backyard and the species did not attack each other. The Noah's Ark reference is good. All those creatures put together. Fire fighting nephew must be exhausted Andrew, they have had a lot to contend with. Until the welfare of the earth becomes priority with the wheelers and dealers at the top things won't improve, that's why it's so important for everyone to make the best use of their vote, hopefully people power can still influence! Grace, I agree with you. We need to vote carefully. Fire Fighting Nephew is not the brightest spark in the fire, but he is knows his job and is just the loveliest of guys. Sami, indeed so many leaders don't. They think of the short term. School children in the UK to go on strike on Friday over inaction on climate change. What's the point of going to school to get qualifications if society disintegrates? Tasker, that is quite true. What is the use of prosperity when planet earth becomes so degraded and poisoned. For 3 weeks now we have children and teenagers and students on Thursdays and Saturdays on the street, claiming for a world saving climate because our politicians are also in bed !And there are a lot of kids 15.000 were on the streets only in Brussels ! In other cities too and in other European countries ! I have seen on TV the catastrophes in Australia it's terrible ! And the US was not saved either ! Gattina, I wasn't aware of the school children protests in Europe. I hope they remember when they become adults and our leaders. The lack of interest in climate change by so many in power terrifies. Sandra, as the evidence mounts if front of their eyes. I just experienced record breaking cold in Florida when I was there. At the same time, they were having Red Tide pollution that made me quite ill. I come home to New Hampshire to sub-zero (F) temperatures and heavy snowfall. I know I live in a snowy area, but even this is too much for us! I was reluctant to believe in Global Warming, and I'm not sure that is the best phrase, but the pollution has become so problematic that it is cause severe environmental and weather related changes. And not for the better! Red tide pollution I guess is a kind of algae. They would not be used to cold in Florida. Global warming leads to climatic extremes, not just a warming everywhere.